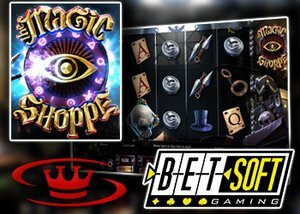 The new Magic Shoppe Slot is here and to get you started and spinning those reels we have a Betsoft no deposit bonus for all our readers. Betsoft's new Magic Shoppe slot is a new addition to their award-winning Slots3 collection. These are true 3D video slots and some of their most popular titles. Magic Shoppe is a new five reel, 25 payline title that is packed full of great features. The game itself is centred around what are called the Celestial Boxes. These are the symbols that will bring you the big wins and trigger the different bonus features. Keep reading to find out about the fantastic Betsoft no deposit bonus you can claim from Superlines casinos. This five reel, 25 payline video slot is sure to entertain. The Celestial Boxes which are Sun Box or Moon Box symbols can appear anywhere on the reels. If you get three or more of either of these symbols you trigger the free spins bonus feature. Each free spins comes with a guaranteed win or feature trigger. Additional free spins can also be won which gives players plenty of chances to win. Magic Shoppe also comes with a Wild Wand feature. What this does is turn the Sun Box, Moon Box, and the Magic Wand symbols into wilds and this can lead to some big wins. If you get three or more Magic Wand symbols anywhere on the reels, you trigger this feature and all the Celestial boxes and magic wand symbols on the reels will turn wild. Mark McKeown, Betsoft's V.P. of Sales and Marketing, said, "We are very pleased to add Magic Shoppe to our Slots3 collection. The art style really brings you into the mysterious mood in the Shoppe, featuring glyphs and other arcane symbolism to enhance the theme. We especially love the free spins round that allows for a guaranteed win or feature trigger, every time. Little wins can add up to a lot, and we are confident that players will truly enjoy this game and all its unique functionality. The new Magic Shoppe slot is now available at all Betsoft casinos and can be played on desktop, mobile, and tablet. Superlines Casino is a great Betsoft casino for Canadian players and offers a wide range of bonuses including a no deposit bonus for players who sign up for a real player account. This is a $10 no deposit bonus that is yours when you use the bonus code KING10. This will give you ten free spins that you can use to test out the new Magic Shoppe slot. That's not all, the Superlines casino bonus for first time depositors is a 400% match bonus up t0 $1,000. The wagering requirements are excellent too at just 30x your bonus and deposit and there is no bonus code required to claim this. There is also an enhanced high roller welcome bonus. If you deposit in excess of $500 you can claim this special offer which is evaluated by the customer support team on activation. All players at this online casino are also enrolled in the VIP program and receive rewards for all the games they play. Extra deposit bonuses are offered on specific payment methods and every Friday there are Happy Hour promotions that run between 2pm and 8pm where all deposits come with a 100% bonus.